All varieties of English pronounce the -s- as in the English word pest. The -u in Buda- is pronounced either /u/ like food (as in US: /ˈbuːdəpɛst/) or /ju/ like cue (as in UK: /ˌb(j)uːdəˈpɛst, ˌbʊd-, ˈb(j)uːdəpɛst, ˈbʊd-/). In Hungarian, the -s- is pronounced /ʃ/ as in wash; in IPA: Hungarian: [ˈbudɒpɛʃt] ( listen). ^ "About Budapest Transport Association". Archived from the original on 14 October 2008. Retrieved 1 June 2016. 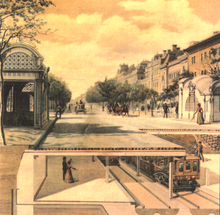 "About Budapest Transport Association". Archived from the original on 14 October 2008. Retrieved June 1, 2016. ^ "telep lista" (PDF). Archived from the original (PDF) on 25 November 2006. Retrieved 1 June 2016. "telep lista" (PDF). Archived from the original (PDF) on 25 November 2006. Retrieved June 1, 2016. ^ a b c d "Aquincum". Encyclopædia Britannica. Encyclopædia Britannica. 2008. Retrieved 2016-03-16. ^ a b c Chisholm, Hugh, ed. (1911). "Budapest" . Encyclopædia Britannica. 4 (11th ed.). Cambridge University Press. pp. 734–737. ^ "CWUR 2015 – World University Rankings". 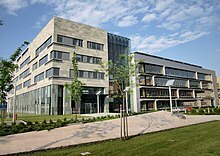 Center for World University Rankings. Retrieved July 25, 2015. ^ "Budapest | History, Geography, & Points of Interest". Encyclopedia Britannica. Retrieved 2018-12-10. ^ Smith, William, ed. (2 March 2006). 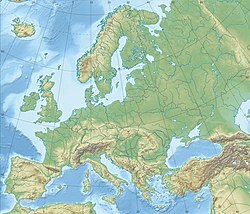 A Dictionary of Greek and Roman Geography. London: I.B. Tauris. ISBN 978-1-84511-001-7. Facsim. of ed. published: London: John Murray, 1872. ^ Times, Celestine Bohlen; Celestine Bohlen Is Chief Of The Budapest Bureau Of The New York (1991-03-10). "Glimpsing Hungary's Ottoman Past". The New York Times. ISSN 0362-4331. Retrieved 2016-11-09. ^ "Mini guide to Budapest's spas". BBC. 26 Apr 2013. Retrieved 25 December 2017. ^ "Budapest was chosen as one of the most creative cities of the world by UNESCO (20 December 2015)". 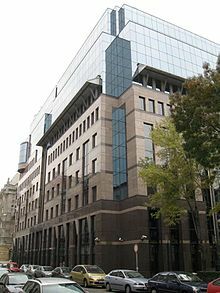 Hungarian Intellectual Property Office. 2016-01-15. Retrieved 2018-10-03. ^ "The 15 Best Places for Jazz Music in Budapest". Foursquare. Retrieved 2018-07-12. Pest is the eastern, mostly flat part of Budapest, Hungary, comprising about two thirds of the city's territory. It is separated from Buda and Óbuda, the western parts of Budapest, by the Danube River. 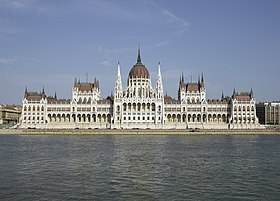 Among its most notable sights are the Inner City, the Hungarian Parliament Building, Heroes' Square and Andrássy Avenue. In colloquial Hungarian, "Pest" is often used for the whole capital of Budapest. The three parts of Budapest united in 1873. Inner City is part of the historic old town of Pest. Until 1949, Inner City was the 4th District. 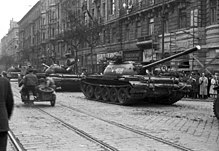 Today it is one of the two neighbourhoods of the District V of Budapest, Hungary, the other one being Lipótváros which is the political and financial centre of Hungary. Budapest's main shopping street, Váci utca is located in the District V, as is the large part of the city's commercial life, banks and travel agencies. Many tourists start sightseeing there. 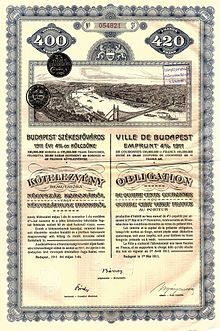 Óbuda was a city in Hungary that was merged with Buda and Pest on 17 November 1873; it now forms part of District III-Óbuda-Békásmegyer of Budapest. The name means Old Buda in Hungarian. The name in Croatian and Serbian for this city is Stari Budim, but the local Croat minority calls it Obuda. The Széchenyi Chain Bridge is a suspension bridge that spans the River Danube between Buda and Pest, the western and eastern sides of Budapest, the capital of Hungary. Designed by the English engineer William Tierney Clark and built by the Scottish engineer Adam Clark, it was the first permanent bridge across the Danube in Hungary. 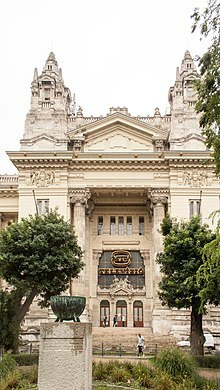 It was opened in 1849. 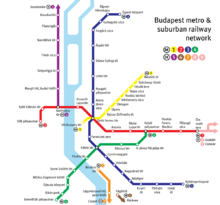 The Budapest Metro is the rapid transit system in the Hungarian capital Budapest. It is the oldest electrified underground railway system on the European continent, and the third-oldest electrically operated underground railway in the world, predated by the 1890 City & South London Railway and the Liverpool Overhead Railway in 1893-96. Its iconic Line 1 was completed in 1896. 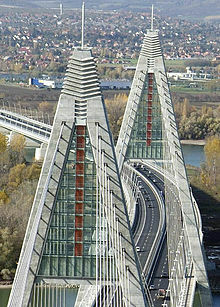 Elisabeth Bridge is the third newest bridge of Budapest, Hungary, connecting Buda and Pest across the River Danube. The bridge is situated at the narrowest part of the Danube in the Budapest area, spanning only 290 m. It is named after Elisabeth of Bavaria, a popular queen and empress of Austria-Hungary, who was assassinated in 1898. Today, her large bronze statue sits by the bridge's Buda side connection in the middle of a small garden. Árpád Bridge or Árpád híd is a bridge in Budapest, Hungary, connecting northern Buda (Óbuda) and Pest across the Danube. Gellért Hill is a 235 m (771 ft) high hill overlooking the Danube in Budapest, Hungary. It is part of the 1st and 11th Districts. Gellért Hill was named after Saint Gerard who was thrown to death from the hill. The famous Hotel Gellért and the Gellért Baths can be found in Gellért Square at the foot of the hill, next to Liberty Bridge. The Gellért Hill Cave is located within the hill, facing toward Hotel Gellért and the Danube River. Budapest, the capital of Hungary has 23 districts, each with its own municipal government. 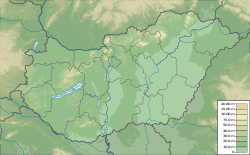 Central Hungary is one of the seven statistical regions in Hungary. It includes Budapest and Pest County. The Danube Promenade is located on the Pest side of Budapest, Hungary. On the bank of the Danube, this promenade extends from the Széchenyi Chain Bridge to the Erzsébet Bridge. Újbuda is the 11th district of Budapest, Hungary. It is the most populous district of Budapest with 137,426 inhabitants (2008). Until the 1890s, Újbuda's present territory was a field south of the historical town of Buda. The construction of a new residential area started in the 1900s, the present district was formed in 1930. From 1880 to 1980, Újbuda's population increased from 1,180 to 178,960. There are boulevards, avenues with tram lines, and communist-era housing estates in the district. Line 4 of the Budapest metro passes through Újbuda. Hajógyári Island or Óbudai-sziget is the largest Danubian island in Budapest. Located in District III, it is a popular recreational area, year round. It is the home of the international Sziget Festival every August. The tram network of Budapest is part of the mass transit system of Budapest, the capital city of Hungary. The tram lines serve as the second most important backbone of the transit system, carrying almost 100 million more passengers annually than the Budapest Metro. District V is the heart of Budapest and the political, financial, commercial and touristic center of Hungary. The name of the district is Belváros-Lipótváros, which refers to the two historical neighbourhoods that is located in the district; Belváros and Lipótváros . Inner City is the old town of Pest, while Leopold Town was established in the early 19th century, and became the political and financial centre of Hungary in the early 20th century when the Hungarian Parliament was built. 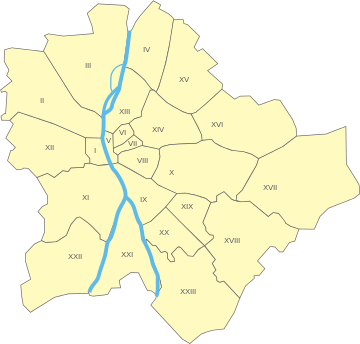 The two neighbourhoods were originally the 4th and 5th districts of Budapest until 1950 when the two districts were merged and number IV was given to Újpest.